There’s a wonderful new CD/DVD set of Dan Gellert, old-time fiddler and banjo player, put out by the Old-Time Tiki Parlour (http://oldtimetikiparlour.com/) based in Los Angeles. Dan’s fiddle and banjo style make him one of the premier old-time musicians around. I recommend this set at the highest level, whether you are already an old-time musician or fan, or just want to experience the music played at its best. I believe that Dan’s recordings are limited besides this one—two cassette albums, one with Brad Leftwich (“A Moment In Time”) and the other with his band Shoofly (“Forked Deer”), plus a CD of Dan called “Waitin’ On The Break Of Day”. One might ask why one would want a video of the same tunes that are on the audio CD. My answer is a long one. First, Dan’s style is iconic, masterful, and beautiful, and therefore possibly a mystery to anyone wanting to use it improve his/her own playing. The combination of audio and video gives a potential leg up to understanding that mystery. Second, this is a wonderfully produced, recorded, and videoed set that has excellent audio and visual quality, greater than recordings or films of past (sometimes LONG past) players available online or elsewhere. The quote from Dan about how to play like he does is, “Listen to the same dead guys that I listened to.” That’s not always easy when old technology gets in the way—this set eliminates those problems. Third, Dan’s rhythm and bluesy style come across powerfully when you can actually watch him play and watch him love the music he’s making. Dan Gellert is a legend in the field of old time American music. As a result of the folk music revival of the 1960s and records he heard growing up in New Jersey, he began to master the banjo, guitar, and fiddle, and sing. At an early age he discovered the importance of taking the time to understand the music in a complete and detailed way, as if it were a language. Dan has given a lot of thought to what it takes to make the music sound and feel like the field recordings and old 78 rpm records he has listened to. While Dan is playing, one gets the sense he has entered another world which combines all his influences, yet it is his playfulness and improvisational sensibilities which make his style powerful and instantly recognizable. 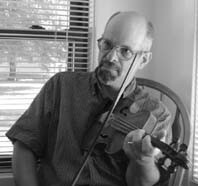 Dan’s fiddling is bluesy and rhythmic and without regard for modern standards of pitch and tone. In other words, he follows his muse, which makes his music stand alone in a world of timid imitators. Not for the faint of heart, Dan Gellert is a commanding and uncompromising talent. After raising a family and playing out mainly in his community (Elkhart, Indiana), Dan is hoping to retire and get out more and share his music. His recordings are few but excellent. Check out A Moment in Time with Brad Leftwich (Marimac cassette). He has cuts on a couple of compilations: A tribute to the Appalachian String Band Music Festival (Chubby Dragon), and The Young Fogies Vol. I (Rounder). He has a segment on the Fiddler Magazine video Carrying on the Traditions: Appalachian Fiddling Today (now out of print), as well as various cuts on the old County Records claw-hammer banjo compilations. Give us your first experience hearing old time fiddling. Wow. I don’t know what my first experience hearing old time fiddling was. It was hearing stuff on records. What, I don’t know in particular, although we had records of the folkies around. You know — Pete Seeger, Woodie Guthrie, Leadbelly, Cisco Houston, those people. I don’t know if there was any fiddle on any of that but I know I heard some of that. I grew up with all kinds of stuff. We had classical music, too, and Gypsy music. Was it the Anthology of American Folk Music? DB: How did you learn? Did live one-on-one interaction play a part in the learning process? DG: There were a few banjo (and mandolin and guitar) players around that I got to watch and sometimes play with. On the fiddle I think it was just me and the old records for maybe the first couple of years. DB: Which fiddle and banjo players have influenced you the most? DG: I didn’t think of it that way when I was learning, but I managed to acquire a few good habits very early on (just plain luck as far as I can tell). I’d been fiddling for maybe 20 years by the time I was hanging around with Brad and heard him talk about “down bowing”. I remember asking him if I played that way, since I’d never paid any attention to which way the bow was going. He said yes. Since then I’ve gotten more and more into teaching, and so I’ve had to learn how to analyze and dissect the way I do things. It still isn’t real easy. DB: What are the most eccentric tunes/recordings in your mind? DG: Strange that I felt an instant negative reaction to this question, as I used to think I was real into eccentricity. My first thought was f*** eccentric, music has to be CENTERED. Everyone has their own idea of where the center is, though. Which doesn’t answer the question. I don’t know. Like, Willie Narmour can be crooked as hell, but he very much makes his own kind of sense. What about Edn Hammons, JW Day, (and lots of others, of course)– eccentric, or just real normal for the mid 19th century? DB: Do you listen to any modern musicians? DG: Not a lot. I do sometimes hear things I like, but I’m getting old enough that long-term memory carries a lot more weight with me than short-term..